The Benghazi’s iconic Tahrir Square and the courthouse that faces it, from where the Revolution was launched on 17 February 2011, was today taken from militants by the Libyan National Army (LNA). Troops are moving further into Suq Al Hout, the penultimate enclave held by Islamist fighters. Air strikes have continued throughout the day. it is reported that Al-Zawia Al-Rifaiya had been taken and there have been intermittent clashes in the Municipal Square. One army source predicted the district would fall shortly. LNA casualties in this operation have been notably light when compared with the dead and injured among the forces that assaulted Ganfouda and finally took the 12 Apartments a month after declaring victory in the rest of the district. 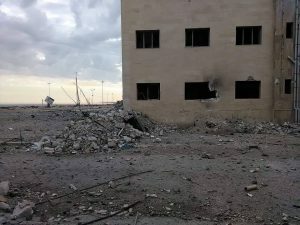 Today a soldier was killed and two companions injured when a device, thought to be a land mine, exploded as they searched the former internal security headquarters which the LNA overran yesterday. Troops have been ordered out of the building until it has been cleared by engineering units. A shell apparently fired from Sabri, landed close to the Jalaa hospital but failed to explode. The hospital is the main reception centre for LNA wounded. There are still no details of militant casualties and prisoners. The Suq Al-Hout operation has been notable for the limited number of social media messages posted by soldiers.